The spotted lanternfly is not a strong or frequent flyer, weaknesses that may hinder its ability to travel long distances by air, according to researchers in Penn State’s College of Agricultural Sciences. Reports of several massive flight dispersals of the insect — tens of thousands at a time — in late summer of 2017 prompted a closer look into the pest’s flight patterns by scientists in Penn State’s Department of Entomology. “Even before these flight episodes, it became apparent to us that we needed to learn the ‘how and why’ of spotted lanternfly flight,” said Thomas Baker, distinguished professor of entomology and chemical ecology, whose research team began the wind-oriented, flight dispersal research in 2017, followed by a second phase in 2018. The findings of the 2017 experiments were published recently in the Journal of Insect Behavior. Since 2014 the pest has caused hardships for southeastern Pennsylvanians by swarming public areas and feasting on the sap of crop plants such as grape vines and fruit trees, where they excrete a sticky “honeydew” that results in a harmful black sooty mold that can impair plant growth. In September and October of 2017 and 2018, Baker’s group set up experimental sites at a fruit farm near Oley, Pennsylvania, and at an additional site in 2018 at Dorney Park in Allentown. Researchers knew that both locations had spotted lanternfly infestations. They made recordings of individual lanternflies’ flight paths during mass flight dispersals, documenting ground speed and air speed, as well as duration, distance and trajectory of flights, among other factors. However, an exception occurs on very hot days when rising, buoyant air increases the insects’ amount of lift, carrying them hundreds of feet high at times. On the few days when this occurred during the two-year study, Baker’s team followed individual, high-flying adults and observed them being carried downwind in slowly descending flights of between 325 and 650 feet. 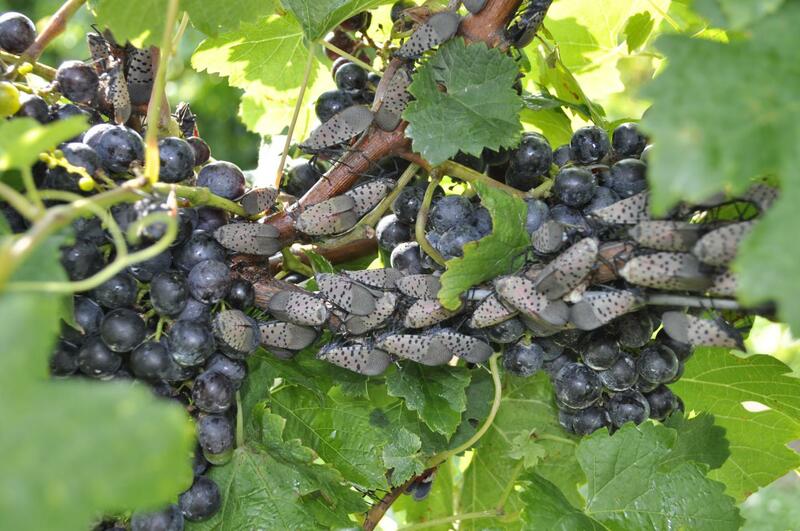 “These occasional longer-distance flights can result in serious sudden arrivals of lanternflies in orchards and vineyards where feeding and damage can occur,” Baker said. He pointed out that the group’s experiments at Dorney Park showed that during flight, the lanternflies orient strongly to anything they can see nearby, including light poles, garbage cans and tree trunks, which they gravitate toward. After landing, the pests immediately begin trying to feed, even on nonedible items, which suggests to the researchers that the lanternflies are taking to the skies in search of food. Baker believes that the lanternflies’ strong visual response to vertical silhouettes, coupled with their tendency to stay visible on these surfaces for a long time — up to several hours at a time — may provide an effective way to document spotted lanternfly populations and possibly to predict their next move. The U.S. Department of Agriculture’s Animal and Plant Health Inspection Service supported this research.